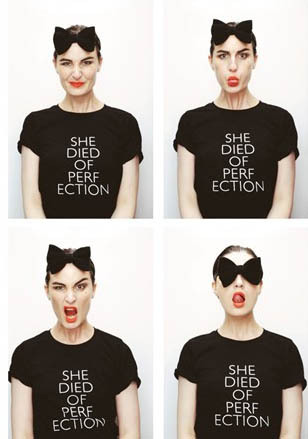 September 2010, sees the brand launch of She Died Of Beauty by long standing friends super model Erin O’Connor and Stylist Kate Halfpenny. The inspiration behind the brand name and collection is to make “a teasing yet affectionate tickle at the fashion industry we continue to love, honour and serve”, showcased through a capsule collection of invigorating and lovingly created organic cotton t-shirts and bags in a classic monochrome palette. The brand origins are firmly rooted in London, with a creative collision of informed education; Kate at St Martins School of Design and Erin within the political & potent world of fashion, providing a signature style, which is witty, purposeful and un-apologetic. The core brand philosophy is based upon ethically and organically sourced materials important to both Erin & Kate “after all, there’s no reason why style and conscience can’t co-exist!”, say the design duo. They have such lovely shirts in there shop. I might be buying one soon.